At Devoxx BE, held in Antwerp, Belgium, Amazon announced a preview release of Amazon Corretto, a "no-cost, multiplatform, production-ready distribution" build of OpenJDK, the reference implementation of Java. During the opening keynote James Gosling, the founder of the Java language, announced Corretto as a drop-in replacement for all Java SE distributions, with the exception of use cases involving features that are not available in OpenJDK (e.g., Java Flight Recorder) or workloads currently being run on non-HotSpot JVMs. 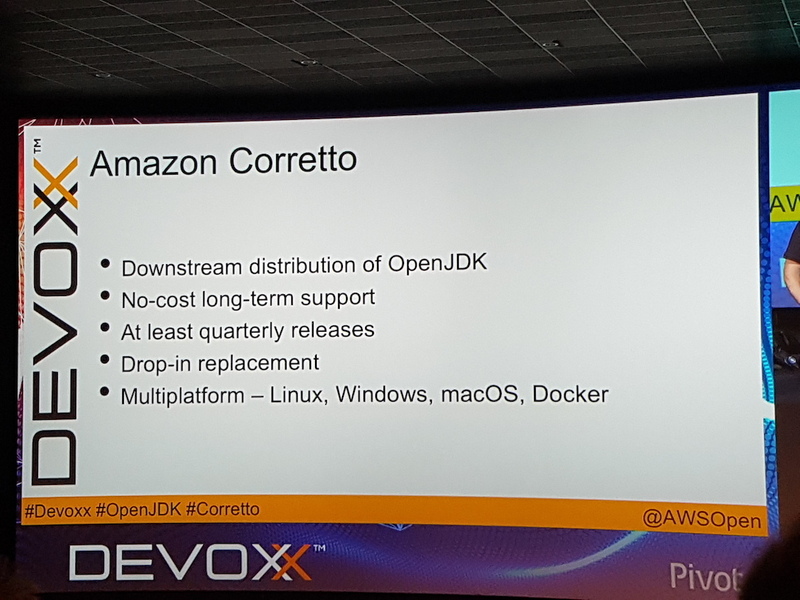 Amazon plans for Corretto to become the default OpenJDK on Amazon Linux 2 in 2019. The announcement post on the AWS Open Source blog by Arun Gupta, principal open source technologist at Amazon Web Services, stated that Java is one of the most popular languages in use by AWS customers, and that Amazon is committed to supporting Java and keeping it free. We're making [this] available to customers with no-cost, long-term support, with quarterly updates including bug fixes and security patches. AWS will also provide urgent fixes to customers outside of the quarterly schedule. After the recent announcements of changes to Oracle's Java support offering -- principally removing free long term support (LTS) for Java -- many Amazon customers have become concerned that they would have to pay for an LTS version of Java in order to run their workloads. Initially Amazon re-affirmed LTS for Java in Amazon Linux, and this has now been followed up with the preview release of Amazon Corretto. At an additional breakout session at Devoxx BE, Gupta was joined by Yishai Galatzer, manager for the JDK team at AWS. The pair discussed that Corretto 8 includes targeted backports from newer OpenJDK releases, as well as newly-developed enhancements from the associated community and Amazon itself. The release process includes testing on thousands of Amazon production services, which makes it possible for fixes to be released within days of finding issues. Amazon also runs the Java Technology Compatibility Kit (TCK) on each Corretto release to ensure compatibility with the Java SE platform. The additional patches and improvements that are included within the Corretto build which are outside of the current OpenJDK upstream code base enable Amazon to "address high-scale, real-world service concerns, meeting heavy performance and scalability demands". Example of these patches include: [C8-1] Prevent premature OutOfMemoryException when G1 GC invocation is suspended by a long-running native call; [C8-2] Back port from OpenJDK 10, fixing JDK-8177809: "File.lastModified() is losing milliseconds (always ends in 000)"; and [C8-17] Improve portability of JVM source code when using gcc7. Amazon has already made several recent contributions to OpenJDK, and Gupta's blog post states that "we look forward to working closely with the OpenJDK community on future enhancements to OpenJDK 8 and 11". He continues, "we downstream fixes made in OpenJDK, add enhancements based on our own experience and needs, and then produce Corretto builds." This does, however, raise the possibility for potential subtle differences within the upstream OpenJDK repo and Corretto. Once Corretto binaries are installed on a host and correctly invoked to run Java applications, the "existing command-line options, tuning parameters, monitoring, and anything else in place will continue to work as before". However, this does assume execution of an application via the HotSpot JVM, and if an alternative JVM is being currently being used, for example Eclipse OpenJ9, then the command line options that are available via this JVM may be incompatible or require modification. Audience members at Devoxx asked about the possibility of support for other JVMs in future versions of the platform, but Galatzer stated that at this time only HotSpot will be bundled with Corretto. Yes. Corretto-specific pull requests can be sent at https://github.com/corretto. Any OpenJDK related issue would need to be filed in the corresponding OpenJDK repository under the OpenJDK contributor agreement, so the whole community can benefit from the fix. After such a contribution has been submitted to OpenJDK, we recommend discussing with the Corretto team over an issue, and deciding if a PR on Corretto will help accelerate the inclusion of a fix. OpenJDK related bugs should be filed in the OpenJDK repositories, a link to that bug could be filed on Corretto as well. This is to make any code or idea filed on the bug available for the whole community. If there are issues related to build scripts, docs and other artifacts only relevant to Corretto, then they should be filed in the appropriate repo at https://github.com/corretto. At this time, we plan to follow Oracle's LTS release cycle. So, in addition to Corretto 8 and Corretto 11, the next LTS release will be Corretto 17. Having Amazon announce Corretto is great extra recognition for OpenJDK as a viable runtime to use in Production! I think a lot of conservative organizations will see this and say "If Amazon is using OpenJDK as well as IBM, Red Hat et al, then my last doubts are now gone!" "Amazon worked with AdoptOpenJDK, using some of our scripts and expertise to solve kinks in their Windows and Mac installers and improve their story around testing. AdoptOpenJDK's ethos has been about Open Infrastructure As Code (See 3rd bullet point in https://adoptopenjdk.net/about.html) and Amazon was more than welcome to that resource and we look forward to continuing to work with them and have their contributions come back." In order to reduce some of the potential fears about fragmentation, AdoptOpenJDK will be strongly encouraging Amazon and any other OpenJDK provider to upstream their patches to OpenJDK. Amazon agrees with this sentiment as stated in their FAQ (https://aws.amazon.com/corretto/faqs/). We've already had a few million downloads and an incredibly wide range of community members such as IBM, Red Hat, Azul, Ocado, SAP, the LJC (and yes Amazon as well) participating daily. This is a project that people believe is an important public resource for the software industry for a long, long time. Amazon has a long and deep history with Java. I'm thrilled to see the work of our internal mission-critical Java team being made available to the rest of the world. Corretto 8 can be downloaded by visiting aws.amazon.com/corretto, and documentation is available which includes a Getting Started guide that provides a complete set of instructions on all supported platforms. Questions can be asked on stackoverflow or Twitter (@awsopen).